Rolex’s Cellini collection of gold dress watches is far less well known than its famed Oyster series. 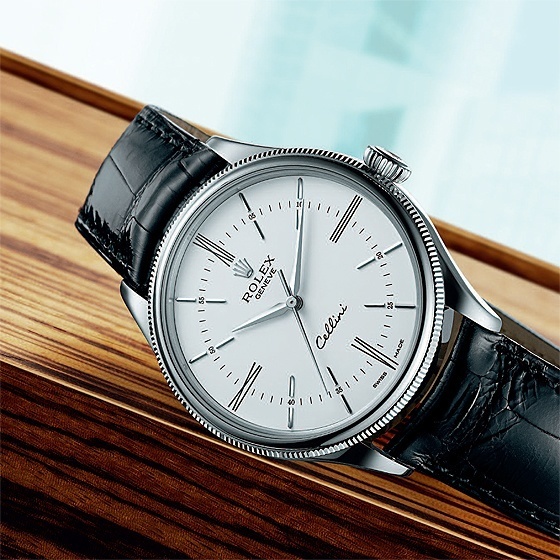 One factor may be that Cellini models have only been available with manual-wind movements. That changed last year, when Rolex launched three Cellini automatics: a time-only model, a date model and a two- time-zone model.
" Although it is not intended to have a vintage look, it incorporates several design elements that echo Rolex’s past, including a curved, polished case with downward sloping lugs, a narrow bezel with fluted ring, a domed and polished caseback and a glossy, varnished strap with narrow, flat- pronged buckle." We tested the time-only watch, called, simply, the Cellini Time. It’s equipped with Rolex’s in-house Caliber 3132, also used in the Rolex Explorer, and known for being extremely sturdy and accurate. The watch has the appeal of a well-cared-for classic from the 1950s. Although it is not intended to have a vintage look, it incorporates several design elements that echo Rolex’s past, including a curved, polished case with downward sloping lugs, a narrow bezel with fluted ring, a domed and polished caseback and a glossy, varnished strap with narrow, flat- pronged buckle. The dial, too, has a classic mien, with its sword- shaped hands and applied faceted markers. The minutes track and the elongated Roman numerals at 12, 3, 6 and 9 o’clock give it a distinctive look. The watch’s 39-mm diameter is appropriate for today’s tastes. The hands contrast enough with the dial to make reading the time quick and easy, assuming there is sufficient light, since luminous coating has been omitted in favor of elegant design. The absence of a date display enhances the watch’s look of elegance and makes operation simpler, as does the fluted crown. It is surprising that the crown is of the screw-down type, more likely to be found on a sports watch than on an elegant dress model, but the screw-down feature does provide added protection and water resistance. The Cellini Time is beautifully fi nished. The dial, hands and case are flawless. The quality of the polishing is especially apparent on the inner surfaces of the lugs and buckle, where many watches reveal burrs or uneven spots. Just as nicely made are the sloping spring bars and the matching strap, which fits closely to the case. The spring bars are placed rather far down on the lugs to improve wearing comfort. The smooth, curved caseback hugs the wrist nicely. The strap initially remained stiff and resisted bending, which caused the watch to slip back and forth, but this probably improves after a few weeks of wearing. Small cracks tend to appear in a varnished strap because it is less fl exible, and while it doesn’t look bad, perfectionists might fi nd it distracting. They might also find fault with the caseback, which is highly polished, so that even minor scratches will be obvious. 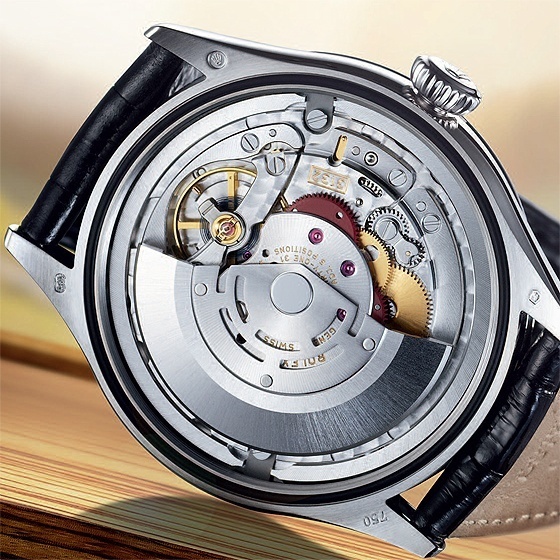 The caseback is solid, as it is on all the new automatics: within the Cellini collection, only the Prince models have windows in their casebacks. But there is no reason for the movement to hide. Calibre 3132 is decorated with a sunburst fi nish on the rotor, perlage on the bridges, polished screw heads and some bevelled edges. The movement has a height-adjustable balance bridge, free-sprung blue Parachrom balance spring made of a patented niobium-zirconium alloy and fi ne regulation via screw weights on the balance wheel. The movement has Parafl ex shock absorbers, which Rolex says increase the balance’s shock resistance by up to 50 per cent. Superior shock resistance is perhaps not necessary with a dress watch, but it can’t hurt. The movement is a COSC- certifi ed chronometer, though this is not noted on the dials of Cellini watches as it is on Oyster models, all of which are COSC-certified. Rolex is known for accurate timekeeping, and our tested watch upheld this reputation. Our Witschi timing machine confirmed the excellent rate results recorded during the wearing test, where the watch showed a gain of 5 seconds per day. On the machine, the deviation ranged from 0 to +6 seconds and the average gain was 3.3 seconds per day. The `10 lakh (approx.) price is appropriate for a gold watch with a good manufacture movement. A Jaeger-LeCoultre Master Control costs a bit more. The steel Rolex Explorer, with the same movement and a case made of steel, costs `4 lakh (approx.). An additional premium of `5.29 lakh (approx.) to `6.6 lakh (approx.) for a gold case compared to steel is reasonable, but it remains to be seen whether the Cellini models will retain their value as well as the Oyster stainless-steel sports watches. Customers in the market for an elegant and discreet gold watch should find what they are seeking in this watch. It has no major weaknesses. The watch is especially notable for its sturdy and accurate manufacture movement and excellent finishing. Perhaps it is time for the Cellini to step out of the shadow of the Oyster and into the limelight.